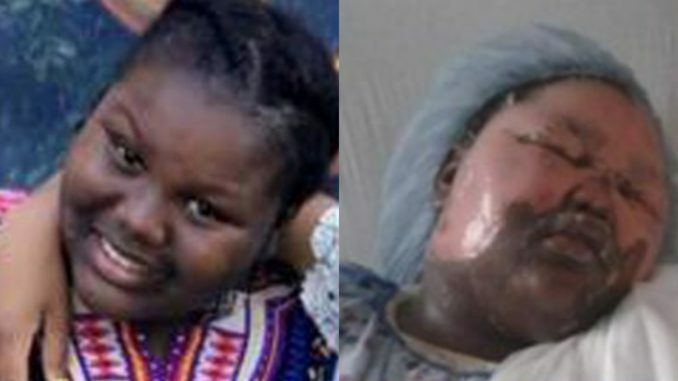 A 12 year old girl has been arrested after a prank gone wrong landed her 11 year old friend in the burn unit. Jamoneisha Merritt is now covered in welted blisters thanks to her “friend”, Aniya Grant Stuart. According to Aniya’s mother, 34 year old Shernett Panton, Jamoneisha moved into her apartment n Findlay Ave in East Concourse a month ago and slept on the living room couch. It’s unclear why Jamoneisha doesn’t live with her mother. The two girls often pranked each other. Shernett says Jamoneisha pranked her daughter by pouring cold water on her while she slept. Aniya opted to go even further, by pouring hot, boiling water on Jamoneisha as she slept in a revenge prank. “She told her if she goes to sleep they were going to do something to her,” said Richardson.